When I was wedding planning, I heard a lot of people suggest you save money by buying a grocery store wedding cake. And, I'll be honest: I scoffed just a little. See, this grocery store that was close to my last job in New York made an amazing sheet cake with cannoli filling. But ... it's a sheet cake. So every time I heard someone suggest a grocery store cake, I thought of a sheet cake. And then my friend Erika started planning her wedding and told me she was planning on buying a grocery store wedding cake. She showed me a photo of the cake and it was beautiful. And, heck. It wasn't a sheet cake. And was definitely not something to scoff at. I kind of really have grocery store envy right now. See, that cake in the photo, that's Erika's actual wedding cake. It's stunning -- and doesn't look like it's from a supermarket. When Erika was ordering her cake, the styles could be combined and colors could be changed. Plus, the grocery store was able to work with her on the size of the cake, making sure it fit her wedding needs. You'll have to go in store to get prices and most bakeries will have books with options. It will also have options for accessories like ribbon and edible flowers. If you want a specific cake topper, though, you're better off ordering one yourself or making your cake topper like I did. So this is what you're hoping for when you considering a grocery store for your cake. No sheet cakes -- unless you order one. See, some catering halls will walk out a pretty cake, but guests are getting served a sheet cake because most of that pretty cake is actually Styrofoam. Crazy, right? If you do buy a grocery store wedding cake, be sure to follow up a week before your wedding just to make sure your cake is on schedule. That's good practice for any bakery, unless it is affiliated with your venue (then your venue will check up on it). 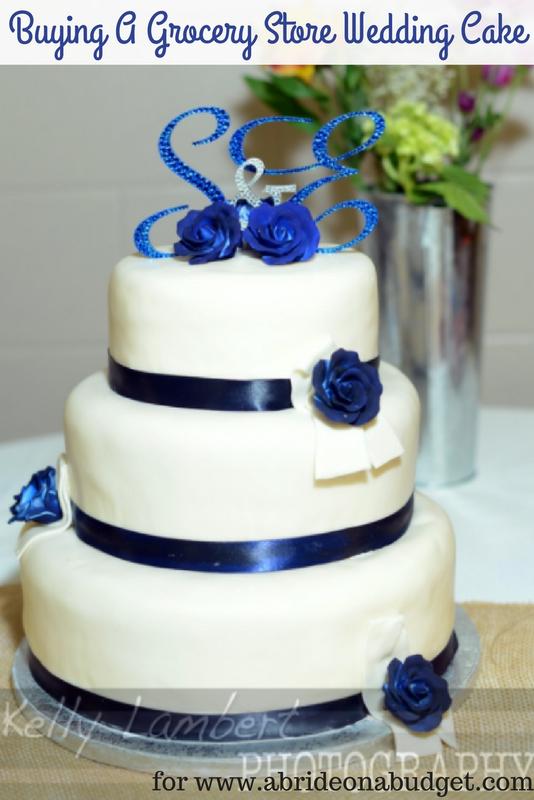 BRIDAL BABBLE: Are you thinking of buying a grocery store wedding cake? While I love sticking to a budget, I love supporting small and local businesses even more. So while prices at a small local bakery might cost more, the taste alone is worth it. Letting them know you support them is icing on the cake. sheet cakes at a wedding is actually fairly common even if you see them cutting a beautiful tier cake. Many people have the bakery decorate faux tiers (fake rounds) and actually only have one or two tiers or real cake then when the cake is cut and passed its sheet cake to save money. I am all for buying from a grocery store. That is actually a very clever idea if you don't want to sink a lot of money in cake. My daughter's cake came with the reception package. I mucked up the top of the cake transporting it home because I did not realize what was in the box. Then wrapped and froze it like that. They are in for a surprise in a year, lol. What kind of cake is underneath the frosting? We picked a vanilla type cake, but they had loads of options! As a cake decorator I see both sides of the coin, but always encourage my brides to do what is best for them. Thanks for sharing this perspective and I hope you join us again next week at Celebrate Your Story. I agree, this is a beautiful wedding cake and much more affordable than some options out there. Thanks so much for sharing with us on Party in Your PJ's! Nice tips for saving on your wedding. Thank you for sharing on Merry Monday! Hope to see ya next week!